Designing automation equipment and systems is not as easy as just sitting in front of a computer screen using some sort of special computer program. Designing quality automation equipment is about knowing your customer's goals and designing an important piece of machinery that meets their needs. It is also about understanding the customer's current installation, limitations and product requirements. Designing automation equipment is about pairing the needs and goals with the experience and imagination necessary to develop a reliable solution. 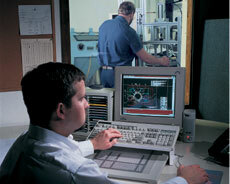 At Dial-X Automated Equipment, Inc. each automated system is unique to its application and final work environment. Our reputation depends on the workmanship and ongoing service provided to each and every customer. We take pride in providing small-company customer attention with corporate cost-effectiveness. The customer is directly involved in the evaluation and approval of the final design - before their automated equipment moves from design engineering to the building stage. Involving the customer at every step in the process helps insure that we effectively meet their specific goals, while strengthening our partnerships. Designing and building automation equipment and systems requires a creative and imaginative engineering team with the knowledge to create a dependable system that does the job it is intended to do. Dial-X Automated Equipment can assist you with all your custom automation equipment and system needs. We will work with your company's engineers and facility personnel to ensure we meet everyone's goals. We design, build and integrate automation systems for OEMs, as well as for industrial and factory operations. For further information or a free quote on designing automated systems, contact Dial-X Automated Equipment, Inc.